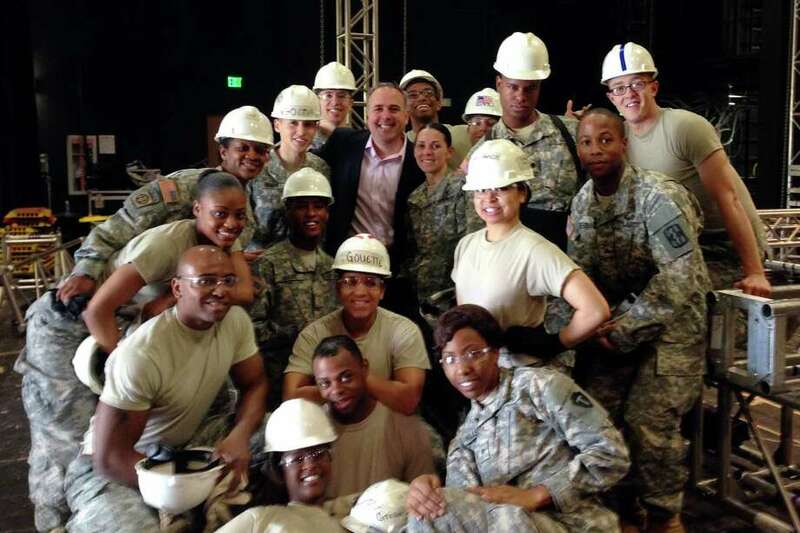 Steve Sellery, wearing a suit in the middle, stand with some of the Army entertainment crew at Fort Sam Houston Theatre at Joint Base Fort Sam Houston, San Antonio, Texas. At 7 p.m. one night last September, Darien native Steve Sellery received a call on his cellphone with good news from the Department of Defense. The man on the other end of the call told Sellery that the game show he developed for military personnel and their families, "Quest for the Best," would have the Department of Defense's support. Four days prior to the call, Sellery had sent an email to the Department of Defense, but he was certain he would not get a response. The show will be a trivia game that involves the entire audience. By using hand-held devices, audience members play through five trivia rounds. The top five players enter the final round where they compete for a grand prize. The game will take place on military bases around the country. "The event will be the first of its kind in the military," said Josh Gwinn, division chief for community recreation in the DoD, in a release. "We see this event as a way to provide unique entertainment for our soldiers and their families." "I was always fascinated with creating platforms that engage people," Sellery said. Sellery, 44, who grew up in Darien, moved to California in 1974. The move couldn't keep him away from the Gold Coast town, though, so he would spend his summers with his grandmother, Elizabeth Forster. Forster, who Sellery refers to as Granny Boo, was head of school at the King Low Heywood Thomas School in Stamford for nearly 50 years. Sellery's parents and grandmother ingrained in him from a young age the desire to help other people, he said. "My mother instilled in me the value of wanting to make a difference in others," said Sellery, who now lives in South Carolina. Growing up, he watched his mother work with athletes -- she ran former baseball player Steve Garvey's celebrity sports classic to benefit multiple sclerosis -- and his father work in entertainment -- at Film Ways Studios in Los Angeles, and as an adviser to the U.S. Olympic Committee in securing and helping manage the 1984 Summer Games in Los Angeles. Sellery became interested in serving the greater good. After spending 10 years with the Golf Channel, Sellery founded the Rising Tide Sports & Entertainment Group, a brand development and marketing firm. He wondered which audience he could serve that would resonate with his innate desire to make a difference. The answer, he learned, was the military. Prior to working for the Golf Channel, Sellery was a teacher in Virgina. After speaking with former students who serve in the military, he learned that "base life is not close to real life." "Maybe there can be something done on a minor scale," Sellery asked himself about bringing a sense of normalcy to the bases. "Quest for the Best: The Armed Forces Military Challenge" was created with Game Show America, which does corporate game shows. GSA was purchased by Rising Tide Sports & Entertainment Group. The show is at no cost to the military, Sellery said. "We've created this unique experience," Sellery said. "Those serving (and their families) have a chance to play in this game show and have a little sense of normalcy." The show, which is not being broadcast, will premier on July 19 at Joint Base Fort Sam Houston in San Antonio at the request of the Department of Defense. The show is sold out, Sellery said. "The goal is to take this around the world on land and sea," Sellery said. More than 40 bases are being considered for the first season.